Spatial coverage and density of eelgrass beds in the South Slough estuary are mostly stable or may have slightly increased since 2004. Eelgrass bed monitoring in the South Slough estuary was expanded in 2010. Eelgrass beds are among the most threatened habitats on earth, but they are also among the world’s most productive and important living systems. Eelgrass beds serve as food sources, provide shelter, refuge, and breeding and nursery grounds for wide variety of fish (such as juvenile salmon) and shellfish (such as Dungeness crab). They also process nutrients, stabilize sediments, and contribute to protecting coastlines and improve water quality. In general, the spatial cover and density of the individual eelgrass shoots that form eelgrass beds can vary from year to year or decade to decade from both human-caused (e.g., increased nutrient levels/decreased water clarity) and natural (e.g., waves/currents) changes. Eelgrass beds are vulnerable to seasonal and daily variations in rainfall, tides, wind waves and currents. For example, at one of the monitoring sites just north of Valino Island in South Slough, a tidal channel has been migrating through an eelgrass bed since monitoring started at that site in 2004. The natural movement of the channel has physically removed a sizeable portion of the eelgrass meadow at the north end of the site we’ve been monitoring. To truly understand the variability and the long term status of the eelgrass beds in the South Slough estuary, we need to collect data over a period of many years. Figure 3. Percent cover, shoot density and canopy height (blade length) of eelgrass at Valino Island SeagrassNet sampling site. Figure 1. Spatial cover of eelgrass at Valino Island at three transect locations. Figure 2. 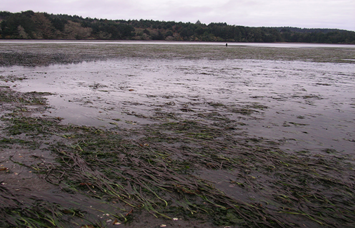 Eelgrass density at Valino Island at three transect locations. With the seasonal data we’ve collected since 2004, it appears that eelgrass bed cover and eelgrass shoot density at our South Slough study sites are relatively stable. 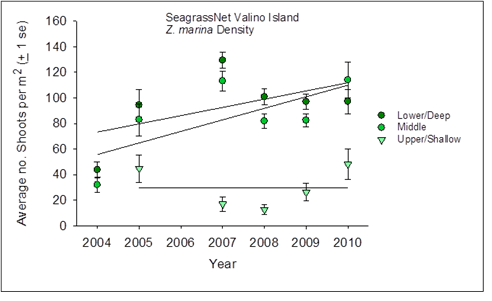 At the Valino Island SeagrassNet site (data from this site is contributed to a global seagrass monitoring network- see Background below), the spatial cover and density of eelgrass shoots show an increasing trend over the 6 year sampling period, especially for the lower and mid-intertidal elevation sample plots (Figures 1 and 2). When data from the three monitoring locations are combined, the trend in spatial cover data shows a slight increase or no change while shoot density is still increasing (Figure 3). This is most likely due to the location of sample plots along Valino Island’s upper monitoring area, which is situated much higher in the intertidal zone than the other two monitoring areas and typically has the most bare plots. One interesting result at the Valino Island site is the trend towards longer eelgrass leaves/blades (greater “canopy height”). 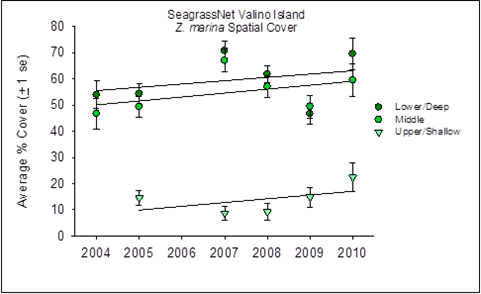 Figure 3 above shows the canopy height to be the steepest upward trend of any of the eelgrass data trends. Although it is a mild trend (r2=0.27), it will be important to continue monitoring to determine whether the trend continues. Some studies have shown that: 1) eelgrass blades grow longer under low light conditions, while shoot density decreases; 2) excess nutrient levels from sediment supplies lead to greater canopy height; and 3) excess nutrient levels from water column supplies resulted in shorter canopy height, likely due to interactions of algal competitors (Short et al. 1995). Figure 4. Average annual spatial cover of eelgrass at four monitoring sites. Figure 5. Average annual eelgrass density at four monitoring sites. 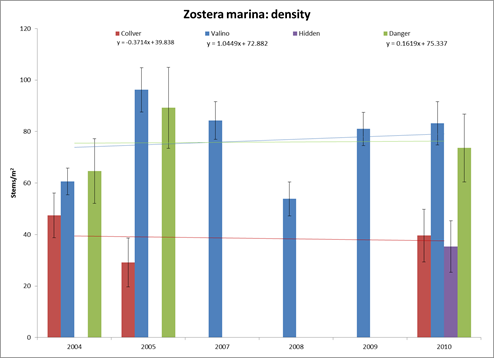 We compared the Valino Island site trends with the more limited eelgrass data we have for other South Slough sites at Collver Point (lower estuary), Hidden Creek marsh (upper/mid-estuary), and Danger Point Marsh (upper estuary)(Figures 4 and 5). 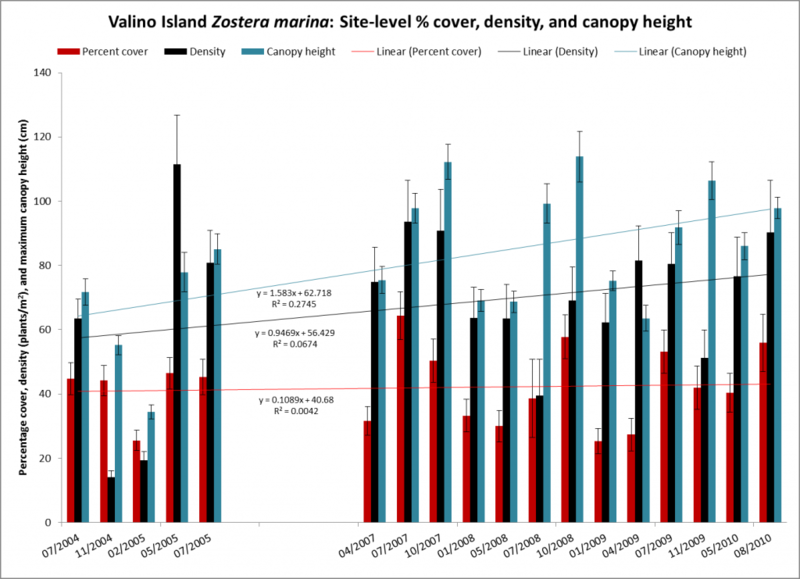 The Valino Island site shows the same trends while at the Danger Point site, eelgrass shows a slight increase in both percent cover and density measurements, and at Collver Point, eelgrass shows a slight decline in both cover and density. We only have three years of data for the Danger and Collver Point sites (2004, 2005, 2011) so we need additional years of data to determine the strength of those trends. Data has so far been collected at the Hidden Creek site in 2010 only. For those locations in South Slough with multiple years of observations, the overall average percent cover of eelgrass is decreasing slightly (slope = -0.4 ); while shoot density is slightly increasing (slope = 0.23). 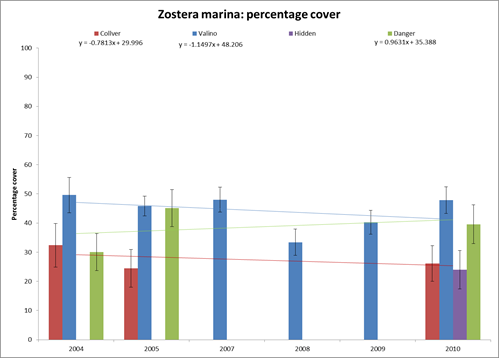 Although more information is needed to confirm these trends, these results suggest that the extent of eelgrass bed cover and shoot density have remained fairly stable over the 6 year monitoring period. Seagrasses are underwater flowering plants that can form vast meadows and provide nurseries, shelter, and food for a variety of commercially, recreationally, and ecologically important species, including fish and crustaceans. Seagrasses process nutrients, contaminants, and sediments in estuaries and coastal systems and are closely linked to coral reefs and mangrove forests in the tropics, and to salt marshes, kelp forests, and oyster reefs in temperate waters. They are different from other aquatic flowering plants because of their salinity tolerance, preference for submerged habitats, and their ability to reproduce and disperse their seeds through the water. Existing at the interface of the land margin and the world’s oceans, seagrasses are threatened by numerous natural changes as well as changes linked to human activities. Along the Pacific Coast of North America, eelgrass (Zostera sp.) covers over 1,000 km2 and dominates the shallow subtidal and lower intertidal areas of estuaries. Because eelgrass grows in the transition zone between land and sea and supports a diverse array of native and non-native species, eelgrass beds have been subject to alteration and have become indicators of change in the estuarine environment. Eelgrass may be a valuable indicator of the health of the estuary and nearshore environment. The South Slough Reserve staff began monitoring eelgrass in 2004 at the Valino Island site as part of SeagrassNet, an international monitoring program that started monitoring eelgrass in the Western Pacific region in 2001. 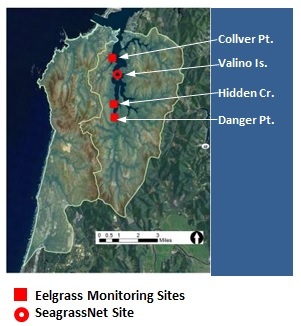 The Reserve monitors additional eelgrass beds in South Slough as part of the National Estuarine Research Reserve System’s System-Wide Monitoring Program. These sites are located along South Slough’s “estuarine gradient”: from the mouth of the estuary near the ocean to the brackish creek-dominated part of the estuary. Reserve science staff tracks estuarine water quality trends in the South Slough estuary, in part to look for water quality trends that may indicate changes in “eutrophication”: increased nutrient levels in the estuary. Eutrophication may lead to algal blooms, which typically decrease light availability for eelgrass growth in subtidal and deep intertidal areas of the estuary. We are also tracking local sea level rise. Reduced light conditions resulting from deeper water during high tides may ultimately have the same effect on the spatial distribution and overall health of eelgrass beds as eutrophication. Invasive species are also an issue. Japanese eelgrass (Zostera japonica) does not directly compete with native eelgrass (Zostera marina) but this may change when the extent of intertidal flats are reduced by rising sea levels. More intense and numerous winter storms anticipated as part of the local effects of climate change may result in larger waves propagating into the lower estuary. Increased wind waves and currents have the potential to affect the ability of eelgrass beds to persist in the lower South Slough estuary (e.g., Valino, Collver and Hidden Cr. sites) where the beds are relatively exposed to those erosive processes. Seagrass meadows are in decline worldwide due to both natural and human-induced disturbances. Natural disturbances include coastal uplift from tectonic plate movement, coastal erosion from ocean currents, winter storms/hurricanes/cyclones, and biological interactions such as grazing, natural disturbance of sediments, and disease. Human-induced disturbances include reduction of water clarity by sediment loading and eutrophication, mechanical damage from dredging and filling, certain fishing practices especially aquaculture, trawling and dragging, and toxic compounds from oil spills or heavy metals from contaminated water or sediment (Short & Wyllie-Echeverria 1996). Loss of seagrass habitat has been documented since the earliest records in 1879. A recent study found that seagrasses have disappeared at a rate of 110 km2 per year since 1980 and 29% of known seagrass meadows have disappeared since they were initially measured. Since seagrass loss is comparable to habitats such as mangroves, coral reefs, and rainforests, they are placed among the world’s most threatened ecosystems. Despite the worldwide decline of these habitats since the 1940s (Nelleman et al. 2009), the coastal estuarine habitats in the Pacific Northwest are relatively rural and often less disturbed by human activities compared to the more urban regions of North America (Borde et al. 2003). Important baseline documentation of historical habitat change of eelgrass areas exists for three of the four largest Pacific Northwest estuaries, including Coos Bay. Borde, A.B., R.M. Thom, S.S. Rumrill., and L.M. Miller. 2003. Geospatial habitat change analysis in Pacific northwest coastal estuaries. Estuaries 26: 1104-1116. Nelleman, C., Corcoran, E., Duarte, C.M., Valdes, L., DeYoung, C., Fonseca, L., and G. Grimsditch (eds). 2009. Blue carbon. A Rapid Response Assessment. United Nations Environment Programme, GRID-Arendal. Short, F.T. and S. Wyllie-Echeverria. 1996. A Review of Natural and Human-induced Disturbance of Seagrasses. Environmental Conservation 23(1):17-27.